It’s a self-evident truth, not to mention a basic principle of homeostasis, that what goes in must come out. Around this time of year, huge trucks full of grapes go into wineries. Months or years later, the bottles of wine that come out of those wineries look a lot smaller than the grapes that went in, and they are. So, clearly, the balance has to be coming out somewhere. You might not think about winery waste as pollution, but the European Union does, and with good reason. Winery leftovers pile up fast and can cause some serious environmental problems if not disposed of properly. But they can also be an unexpected reservoir of useful compounds, and researchers are actively working out alchemy to transform this muck into purple gold. 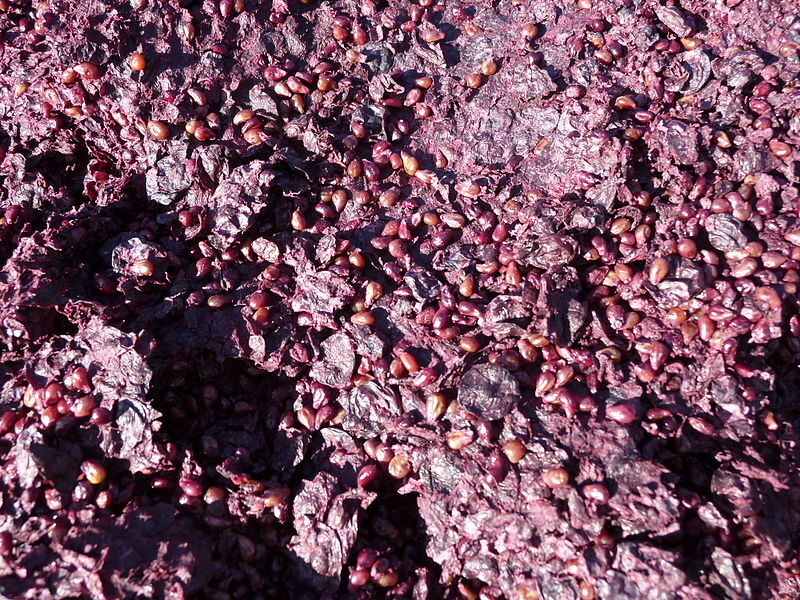 The largest fraction of winery waste—excluding winery wastewater, which we’ll get to later—is pomace, or the skins, seeds, and stems left after juice or wine is pressed. White grapes, pressed before fermentation, yield moist, sticky, and sugar-rich pomace; red wine, fermented on the skins and then pressed, results in drier pomace full of alcohol instead of sugar. The most traditional way of dealing with pomace is to make pomace brandy. Grappa—which by European Union regulations can be made only in Italy, the Italian portion of Switzerland, and San Marino—is the best known of the pomace brandies, but every winemaking culture has its equivalent: marc in France, orujo in Spain, tsipouro in Greece, raki in Croatia and Turkey, and so on. The United States, characteristically, is rather behind the EU, so pomace brandies made in the US can still be called grappa. American pomace recycling was very rare until the past five or ten years, but the frugal process is encountering a renaissance as distillery laws change to make craft distilling more practical and profitable. Soft Tail Spirits in Woodinville, WA, is a good example of a small distillery making use of local wineries’ pomace to create a marketable (and delicious) second product, as is Clear Creek Distillery in Portland, OR and the Finger Lakes Distilling Company in Burdett, NY. 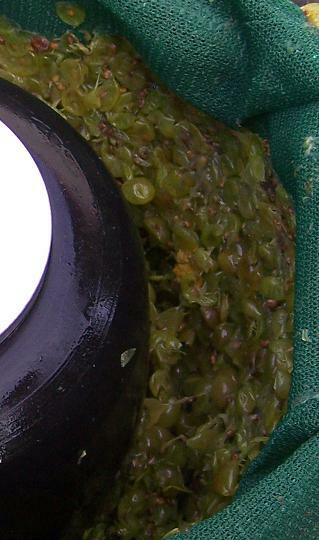 European Union (EC 479/2008) regulations actually mandate that grape pomace and lees from wineries be sent to alcohol distilleries where the residual ethanol left trapped in the skins and seeds (and sometimes stems) can be pulled off to use in fortifying spirits or in other industrial applications. The EU currently subsidizes that distillation, though those subsidies are scheduled to end next year. Regardless, it’s well-known that smaller wineries don’t comply; the price of collecting and transporting the pomace prevents small transactions from being practical or profitable. For the pomace that does make it to those distilleries, even distillation yields stripped pomace with some residual sugar or alcohol. The same is true of the grappa-making process; there are still solids that need to go somewhere. So, at the end of the day, something else has to be done with the mess of grape skins and seeds and stems that comes out of wineries’ back doors. Some of it is thrown away and ends up in landfills, but there are much better options. Composting is an obvious solution, though leftover grape bits are a challenge to compost. Grape pomace is packed with phenols and other antimicrobial compounds which inhibit bacterial decomposition, which means that extra attention has to be paid to getting a winery compost pile started 1. Vermicomposting—composting with worms—is an especially effective way to get things going, however, and composting breaks down enough of those problematic polyphenols that the resulting organic matter can be used for growing mushrooms, as a replacement for perlite in soil mixes, in the garden or on the farm. Another obvious solution that ends up being less than easy to execute is feeding pomace to livestock Unlike many other agricultural byproducts, winery waste isn’t ideal animal feed because it is difficult to digest and relatively nutrient-poor2. For comparison, alfalfa hay is nearly 70% digestible, but grape pomace is only about 30% digestible3. Cattle will eat the stuff, but it’s just bulk; they require more total food when pomace is mixed into their rations. Another problem is that animals will only eat the pomace when it is very fresh, within a day or two of being pressed – heck, can you blame them? Since pomace is very much a seasonal product with tons produced during a few short weeks in the fall and nearly none produced the rest of the year, transporting and using all of that fresh pomace simply isn’t practical for commercial animal-raising operations4. 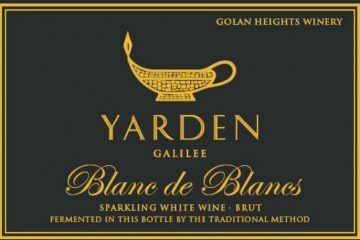 That said, some smaller wineries do feed small amounts of grape waste to their own cows, pigs, or even turkeys, where the pomace serves more as a meat-flavoring agent than a way of fattening up the animals. Bigger wineries can sell their pomace to companies that mill grape seed oil from the seeds—grape seeds are about 10-20% oil—and strip tartaric acid—used for cream of tartar, among other food applications – from the skins. The sugar left in white grape pomace can be used to feed bacteria in industrial fermentations that produce useful compounds like xylitol – a popular low-calorie sweetner—and lactic acid, and even surfactants that can be used to emulsify kerosene-water mixtures5. Lees—dead yeast—can be used quite effectively as a source of nutrients for those bacteria, too6. But again, industrial fermentations tend to use the cheapest source of sugar on the market. While most have the flexibility to use different sources of sugar as the seasons change, pomace may not be the cheapest thing available, and if it’s not, it won’t be used. One of the niftier uses of pomace is as a dietary supplement, since all of those anthocyanins that cause so much trouble in composting or feeding animals are being shown to have useful health benefits. A 2010 study, for example, suggested that moderate quantities of “pomace extract” can protect mice from developing type II diabetes7. Pomace extract has antibacterial properties, too, and could be used either in food preservation as a natural alternative to synthetic preservatives89. Of course, we’ve known that pomace extract is an effective antibacterial for at least ten years now and it’s yet to be used on any significant commercial scale. 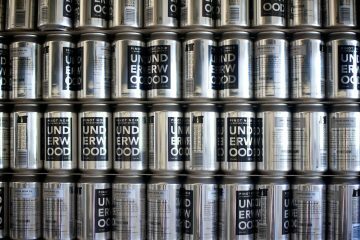 The challenge, as it so often is, will be making these alternative uses for common waste products profitable (or at least cost-effective) for the wineries, the companies making pomace-based products, and the people or industries who might use those products. 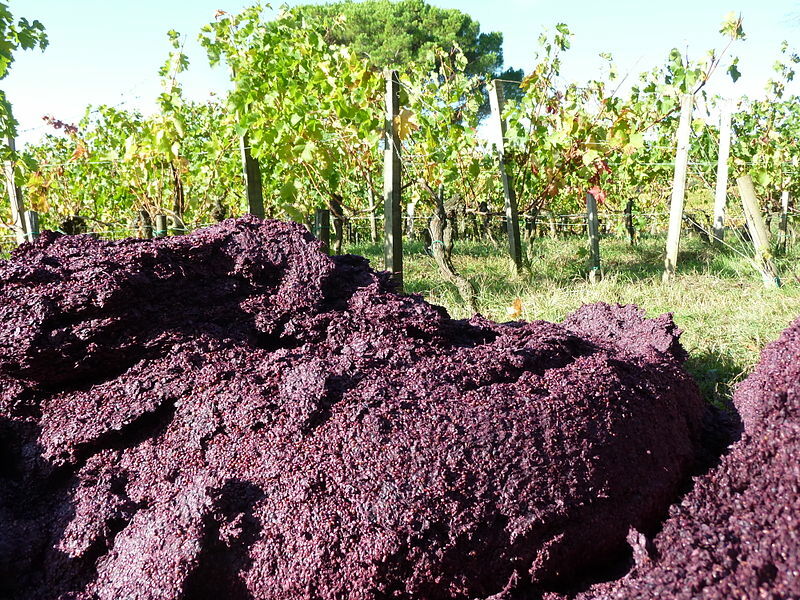 If dealing with pomace is a problem, dealing with winery wastewater is an even bigger one. Making wine involves a lot of washing, which necessarily generates a lot of water. Sending it down the drain has problems, and not just because there is so much of it. Winery wastewater tends to be laden with sugar, which makes it similar to the fertilizer-laden run-off from commercial farms and golf courses and such about which we tend to hear so much. Both can cause algal blooms – overgrowth of algae caused when algae eats up and multiplies off of extra nutrients in water – which do all sorts of bad things to aqueous ecosystems. Agricultural wastewater, including the stuff from wineries, is therefore pretty tightly regulated in the EU and the United States. A common way of dealing with winery waste water is simply trying to degrade the biological elements in the same kinds of ways we use to deal with sewage water to yield clean, reusable water. But 1.5% of all energy used in the US is used to treat wastewater10. And, again, there are more interesting options. The possibility of turning winery waste into biofuel has been studied since the 1980’s, though implementation is slow to follow innovation11. One theoretical option is to combine winery waste and winery wastewater with animal manure and “digested” by anaerobic bacteria to generate methane12. The most interesting way of dealing with agricultural wastewater is, I think, the microbial fuel cell or, in other words, the living, recharchable battery. The latest versions of microbial fuel cells use bacteria already present in wastewater to simultaneously produce energy and clean up wastewater. Sounds like magic, doesn’t it? Well, sometimes microbiology looks pretty darn magical. The reason the microbial fuel cells works is because bacteria (and humans, and other living things) obtain energy from their food by oxidizing it, or by removing electrons from food molecules—the non-water junk left in the wastewater—and transferring those electrons to a series of molecules lower down on the energy scale. The final electron acceptor in that cascade is often oxygen but, if oxygen isn’t available, certain bacteria can be forced to use the metal battery electrode as the final electron acceptor. Those electrons flow to the other electrode of the battery, which is exposed to oxygen, and where the electrons will be transferred to oxygen (plus a couple of protons) to yield water in a tidy, non-toxic fashion13. Naturally, the logistics of microbial fuel cells are still being worked out, but we’re likely to hear a lot more about these things before too long, especially if the explosion of scientific research articles on the topic this year is any indication. As is so often the case, it seems as though brilliant ideas for improving our use of resources and reducing our environmental impact are at the mercy of money; brilliant ideas fizzle if they don’t make someone money or if no one is willing to pay for them. Grappa is a superb example of turning garbage into something people will pay money for, and not just because it’s “green,” but because grappa is good stuff. If industrial chemists and microbiologists continue to improve the efficiency of “recycling” systems, I have high hopes that we’ll be buying food additives and power made from winery garbage before too long, not just because it’s “green,” but because it’s good stuff. Interesting article about a topic we often chose to ignore. Here in Champagne the collection of pomace forms part of the rebeche regulations and the pomace is collected by the distillery who will turn it into Marc or bio-fuel. I noticed the same in the South of France when I worked vintage there. In New Zealand, there are also regulations around what to do w the pomace, and the winery I worked for used to dispose of it at a nearby farm who would mix it up in its animal feed. I really like the (EU subsidized) Bio fuel for local public transport and was very intrigued and hopeful to read that there are other options which can turn winery garbage into useful day to day products. I hope someone (maybe a government) will invest in the extra R & D needed to make this recycling a reality!